This post on reusable grocery bags was sponsored by CarryWell. Learn more about our disclosure policy here. I have been using reusable grocery bags from the time I began doing my own grocery shopping. Not only are the so-called “eco bags” better for the environment, but they are also more convenient, and can help to save money. Being sturdier, reusable grocery bags can be filled with more items than plastic bags can, which means less bags for me to carry. Win! My frozen foods begin to thaw out by the time I get them home and in the freezer since I live a good 15 minutes from the nearest grocery store. I have had more than one leaking melted ice cream incident, and those are no fun at all. Thank goodness for freezer bags! Certain stores will take money off your order for each bag you provide. Even though this only saves me maybe $.30 cents or so a trip, that savings does add up. Ok, so you get it. I love reusable grocery bags. I am all about them. But why, you ask, do I need 10 more reusable grocery bags when I already have reusable bags? Well to put it simply, my reusable grocery bag situation is a hot mess. I have an unorganized bag of bags, all mismatched, covered in different store and brand logos. They do not spark joy. CarryWell offers a 10-piece reusable grocery bag system of color-coordinated bags. The set comes with 6 grocery bags, 1 insulated freezer bag, 2 produce bags, and a 6 bottle wine tote bag. I was super excited to replace my current chaotic bag situation with the CarryWell system. When my package from CarryWell arrived my first thought was “waaaaaaaait a minute… there is no way 10 bags are in here.” The package was so small. Even when I opened the package I was sure the company had forgotten to put in some bags or something. Once I began removing each bag from the chevron bag and laying them all out I realized they did indeed send all 10 bags. When I brought the set of bags to the grocery store for the first time I realized how thoughtful the company was when designing these bags. The bag has a little loop at the top which can be opened and closed, allowing you to attach the bags to the your shopping cart! 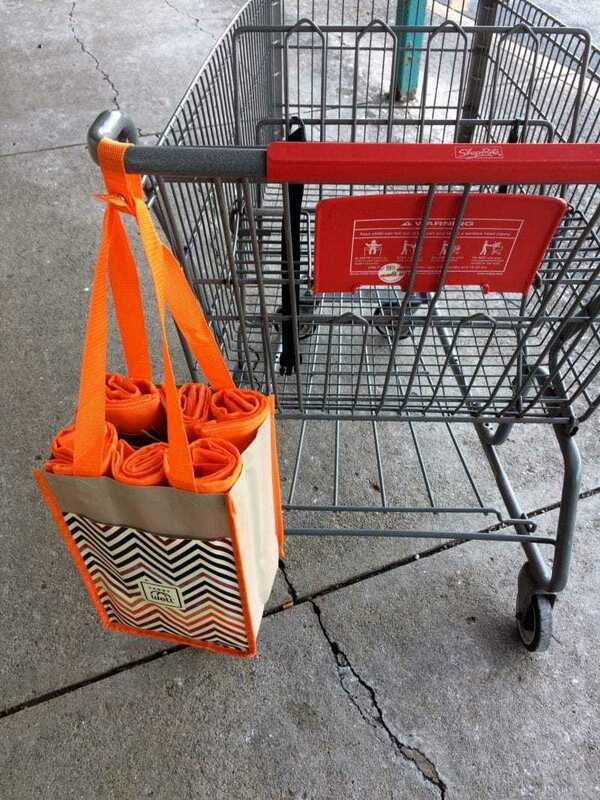 I thought this was totally awesome – no more wasting valuable shopping cart space with my mess of reusable grocery bags! Checkout was quick and easy with this set of grocery bags. Seeing my cart filled with matching reusable grocery bags was awesome. It may seem odd to you, but I love organization and order – it gives me a sense of calm. Loading and unloading the bags from my car was easy enough as well. The bags are all well-made and have sturdy handles, so I didn't have to fear that they would rip on my or anything like that. After unpacking all the bags I had no problem folding them back up and getting them bag in the “bag of bags” state they arrived in. The 6 bottle wine tote is the bag that holds all the other bags for storage. The freezer bag slides right down the middle of the bag, the 6 grocery bags just roll right up and slide into the slots for the wine, and the produce bags go one in each side pocket. 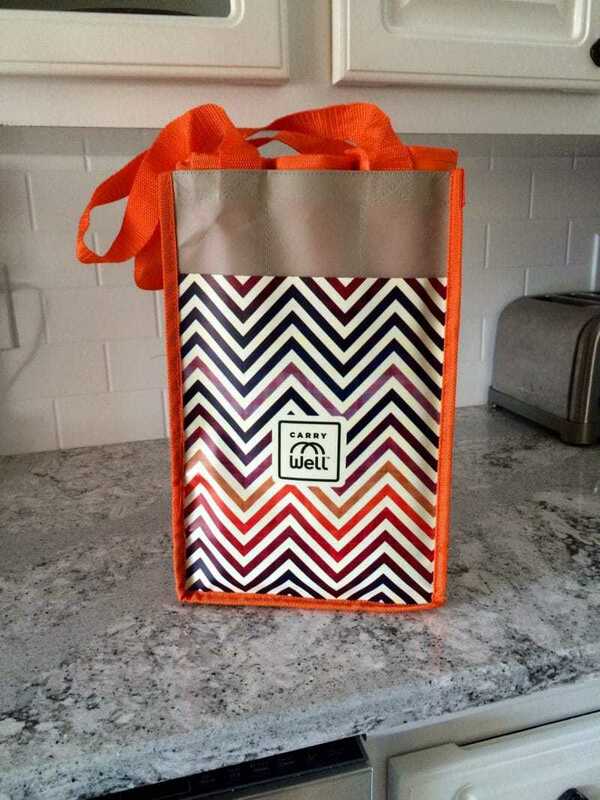 It is remarkable how they can be so easily folded up and put into the chevron bag, making them neat and easy to bring with you to the store, as well as convenient to store in-between trips to the grocery store. I would recommend CarryWell's Reusable Grocery Bag system without hesitation. These are high-quality bags. They are made well and will last for years and years. 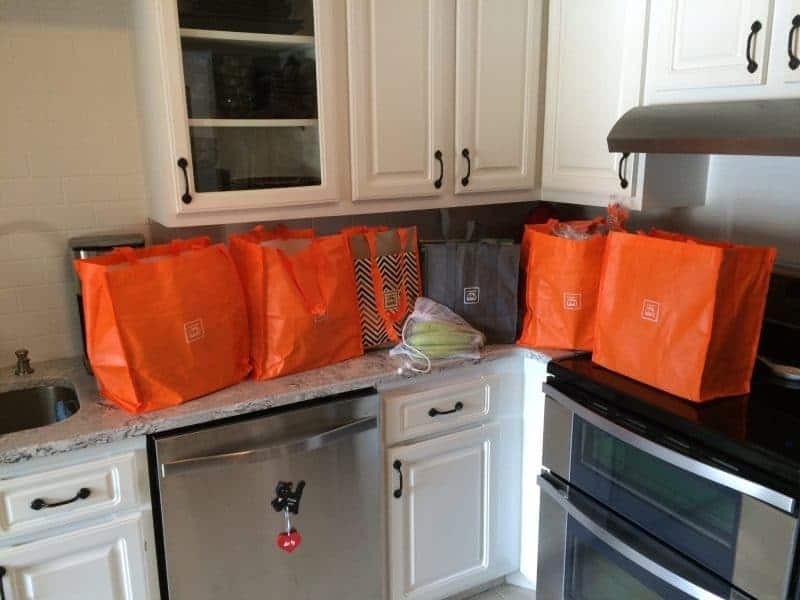 You can purchase the CarryWell Reusable Grocery Bag system on Amazon here, in your choice of orange and grey chevron or green and blue floral patterns. CarryWell also offers a smaller 7 piece set as well, perfect for those that don't need as many bags. Whichever set you select, I am sure you will be as happy as I am with your high-quality set of reusable grocery bags. Those are very nice looking bags. Thanks for sharing! Oh those look wonderful! I have a bunch of freebie reusable bags I’ve had forever, and they are needing to be replaced, especially the insulated bags I have. Heading over to Carry Well right now to take a look, thanks! What a great way to keep them together- I always forget mine! I’ve been really good about trying to bring my reusable bags with me when I shop. These bags need to be a part of my life. They’d totally help me cut down on waste. That’s a clever way to put all the bags into one bag and to clip that on the cart. This makes so much more sense than having a mixed up jumble of them in the trunk. I love to hear about ecofriendly companies. I really do love the idea of being able to use bags that have a story and a meaning behind them. Thank you CarryWell! I love the designs too! 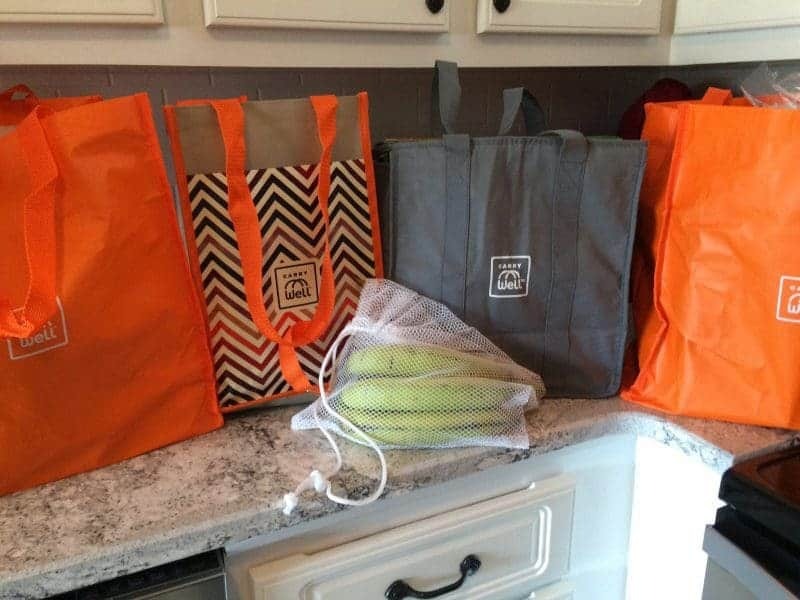 I try to use reusable bags often, but because we usually only make a couple of trips to the grocery store a month because we live about 20 minutes away from the nearest store (ah, rural living) we can never seem to fit all of our groceries into the reusable bags we have. I really like how large these CaryWell bags are. I have a hodge podge collection of sorts of reusable bags. I donated quite a few of them to our local food pantry, and just kept a couple. These are really nice, and look a lot nicer than mine do!! Good to use them! Plastic bags take a toll on the environment. Eco-friendly reusable bags available in a full range of sizes, design, and can be crafted from numerous materials and fabrics. Reusable bags help to cut down on the emission of dangerous greenhouse gases.